To Cite: Javier Pérez Lara F, Ferrer Berges A, Oehling H, Del Rey Moreno A, Oliva Munoz H. Haemostatic Patch Envolving Laparoscopic Trocar to Stop Hemorrhage in the Port Site at the Beginning of the Operation, J Minim Invasive Surg Sci. 2016 ; 5(4):e34138. doi: 10.17795/minsurgery-34138. Background: The number of laparoscopic procedures done each year continues to rise substantially. Clinically significant hemorrhage from secondary port sites at laparoscopy is an uncommon but serious complication and can become unrecognized intraoperatively. Abdominal wall hemorrhage and bruising may complicate laparoscopic operative procedures. Methods: We propose an easy technical gesture to stop the bleeding at the port site in laparoscopic surgery. A simple technique is described to treat this complication. Conclusions: Our proposal is a simple gesture, easy to reproduce and, with no surgical time waste which we can obtain very good results in major bleeding difficult to control with traditional methods by that. Abdominal wall bleeding may complicate any laparoscopic procedure. Piercing or laceration of vessels transversing the abdominal wall during trocar placement is generally the cause. Bleeding may occur at the very beginning of the surgery but, in some cases, it may go unrecognized for a while complicating the operation and at the postoperative course. Planned careful trocar placement can prevent most of these instances that otherwise can be readily managed avoiding severe morbidity (1). There is no debate that laparoscopic surgery has had tremendous positive impacts on patients and the healthcare system. Patients tend to have less pain, less morbidity, and return to their daily activities more quickly. Thus, the number of laparoscopic procedures done each year continues to rise substantially. There are over 2 million laparoscopic cases performed annually in the U.S. (2). Primary and secondary accesses to the peritoneal cavity are the most crucial phases of laparoscopy. In fact, vascular and visceral injuries (0.003%-6%) have been reported secondary to incisions made for positioning the laparoscopic cannulae or ports (3-5). These injuries usually occur during the initial phase of operation or during placement of secondary cannulae, which should be placed under direct vision and with prior transillumination of the abdominal wall (6). 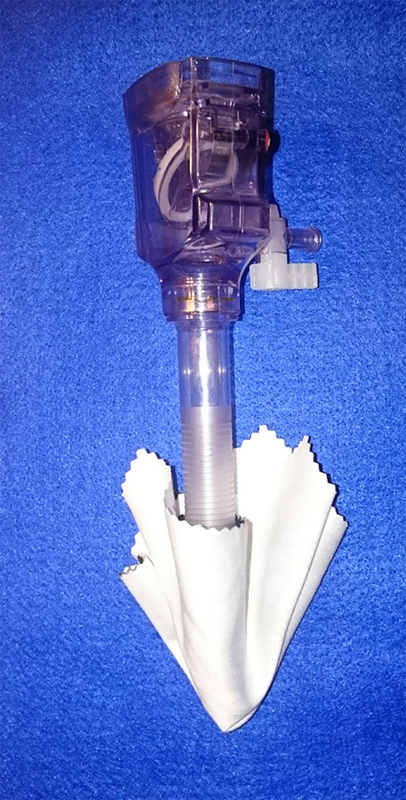 Many options have been described to stop hemorrhage of the trocar site, but all of them are time consuming and some of them are technically difficult. We propose envolving the trocar with a haemostatic patch as a simple maneuver to stop bleeding of the trocar site. We propose an easy technical gesture to stop the bleeding at the port site in laparoscopic surgery. We use a haemostatic patch (Surgicel®) envolving the trocar (any kind of trocar) (Figure 1A). Then, we introduce part of the patch in the distal orifice of the trocar (Figure 1B). Next, we put the introductor into the trocar, so it will hold the patch and then it will not move during insertion of the trocar (Figure 1C). Finally, we insert the trocar into the abdominal wall and thus the patch will be hosted along the bleeding hole (Figure 1D). During the rest of the surgical procedure, the haemostatic patch will be in contact with the area of active bleeding and performs its haemostatic function, helped with the pressure exerted by the trocar (Figure 1E-F). At the end of the surgical procedure, we remove the trocar and check whether the hemostasis is successful or not (Figure 2A-B). Another possibility is to use the trocar without a cannula and with the haemostatic patch blanketing the most distal part (Figure 3). The cannula is then inserted with the blade activated to cut the excess haemostatic patch obstructing the lumen of the trocar. Thus, the haemostatic patch surrounds the trocar throughout its insertion. The umbilicus is the best site for insertion of the Veress needle or primary trocar because the skin is attached to the fascia and anterior peritoneum with minimal intervening muscle or fat. This is not the case above or below the umbilicus. Once one gets away from the midline, the major vessels that can be injured are the superior and inferior epigastric arteries. This course just is beneath of the rectus abdominis muscles. Their usual location is in the mid portion of the rectus sheath running longitudinally. There are numerous small vessels that can be injured as trocars passed through the abdominal wall. Bleeding from the smaller abdominal wall vessels can usually be avoided by avoiding to place trocars or the Veress needle into the location of the epigastric vessels and by transilluminating the abdominal wall prior to inserting secondary trocars (7). 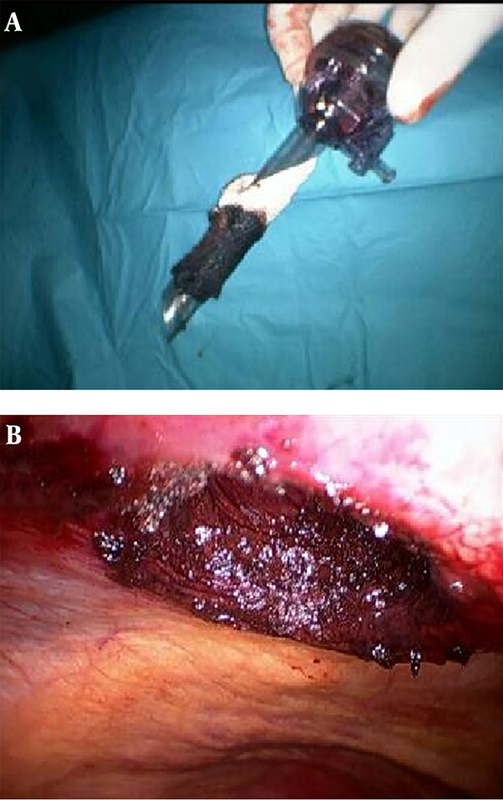 The open technique with radial expanding trocars is recommended for access to the abdominal cavity during video laparoscopy. However, open laparoscopy cannot prevent small bowel injury or postoperative herniation and prolong surgical time (8). If prevention fails, routine injection of lidocaine with epinephrine may decrease skin edge bleeding. Other options for controlling the bleeding include using the trocar that the bleeding is coming through for direct pressure by rotating the tip against the bleeding site. It is possible to try to tamponade by applying pressure to the abdominal wall with a balloon trocar or a Foley catheter pulled against the abdominal wall and attached to a clamp (the temporary pressure usually stops bleeding from small vessels or veins) (8). If significant bleeding occurs, ligation is needed using Keith or Reverdin needle and large suture that can be removed in the recovery room when the patient awakens. If transmural suturing is done, the sutures need to be removed early (around 24 hours) to prevent full thickness abdominal wall necrosis. One should also visualize all ports after trocar removal to ensure that there is no bleeding tamponaded by the trocar itself. This bleeding can often be stopped by cautery or pressure. Occasionally, in catastrophic bleeding from the abdominal wall, an incision should be made to dissect down the bleeding vessels and control the bleeding by enlarging the incision around the port site and direct ligation (1, 9). Most bleeding will present during the procedure, but there can be delayed bleeding from the abdominal wall that presents in the postoperative period. In this circumstance, there is bruising and swelling of the abdominal wall and a drop in hemoglobin. These can be usually managed conservatively with observation. If the patient is unstable, exploration of the port site in question should be done. In any case, preventing or treating abdominal wall bleeding during laparoscopic surgery, prolongs operating time and adds tedious maneuvers to the surgical procedure. Our proposal is a simple gesture, easy to reproduce and, with no surgical time waste which we can obtain very good results in major bleeding difficult to control with traditional methods by that. Authors’ Contribution: Francisco Javier Pérez Lara: made a substantial contribution to the concept and design, drafted the article or revised it critically for important intellectual content, approved the version to be published; Arminda Ferrer Berges: approved the version to be published; Herman Oehling: approved the version to be published; Arturo Del Rey Moreno: approved the version to be published; Horacio Oliva Muñoz4: approved the version to be published.